Platino 3000 is the new numerical control working center designed by Prussiani Engineering, known world-wide for its Customer care, quality, precision and sturdiness of its machines for the processing of marble, granite, stone in general, artificial quartz and ceramic material. Thanks to a special and innovative system of piece fixing, it can process holes for sinks of four kitchen worktops in a rapid sequence. 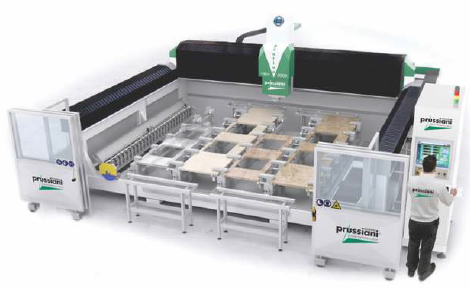 It’s the ideal machining centre for producing tables, sinks, shower trays, bas-reliefs. Platino 3000 is the result of an experience consolidated through many years of innovation. Prussiani Engineering has progressed over the years keeping pace with market requirements, confirming its presence at a worldwide level. It has expanded its line of products promoting ongoing research to achieve technological innovation and improvement and it is able to offer its Customers increasingly efficient and high technology machines carrying a 3 year warranty. The range includes numerous bridge saw models with the patented “CUT&MOVE” system, 5-axes interpolated milling machines for the processing of solid blocks, working centers, water jet cutting machines and lathes. Sturdy, precise and long-lasting machines, suitable for the needs of large and small-scale production. Prussiani Engineering has a worldwide technical-commercial network to guarantee qualified support before and after purchase, with the speed, professional skills and courtesy that distinguishes it. The company now has an optimistic view of the future, aware that the quality of its machines and patents, the ongoing research focused on technological innovation and development will guarantee even further growth. The great project of an Italian company capable of combining imagination and beauty when designing its machines and the endless expressive options that these machines can guarantee to its Customers, is a reality and has a name. Prussiani Engineering: the dream continues.